On behalf of the USA Canoe/Kayak Wildwater Committee and all the USA Wildwater athletes, we thank all those associated with the successful completion of the 2003 Wildwater World Cups in Kernville, California. Young Middleton checks his lines. Photo ©2003 Cap Hugho. All Rights Reserved. The hospitality shown to all athletes was absolutely amazing and will be hard to match. In years of racing internationally, we have never seen such hospitality. The town of Kernville showed each and every athlete the red carpet and the hospitality shown will be carried by these athletes to their respective countries, putting Kernville firmly on the Wildwater map. Tom Wier, 2003 USA National Champion. 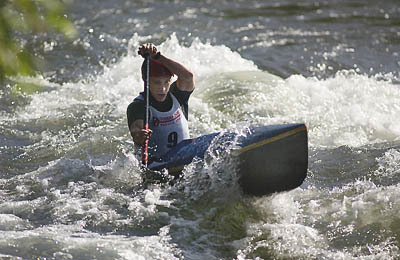 And of course the Kern River is a world class venue worthy of more national and international level events. The diverse nature of the river allowed for three completely different venues and challenges that rival and even outdo the most renowned wildwater courses in Europe. We hope that the Kern River will again play host to Wildwater's best at some point in the future. Again, thank you to all those involved in one of the most remarkable Wildwater World Cup events, for your time, energy and hospitality. We hope to see you all again very soon.